Home Lifestyle Health & Fitness Exercise Vs Diet: How To Loose Weight? If you want to lose weight then focus on your diet than on exercise as diet plays 80% part while exercising plays 20% part in weight loss. Weight loss should be from fat rather than stripping away muscle and bone density. You can burn 300 calories through exercise but you can cut 600 calories by dieting itself. So if you are trying to lose weight than concentrate on proper diet, because if you are eating all bad calories than exercise even can’t help you in losing weight. 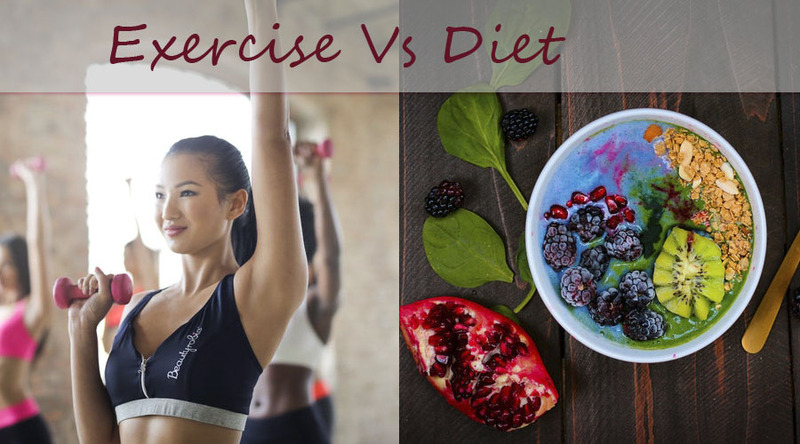 The reason why dieting is more effective than exercise is that it is very easy to consume and gain hundreds of calories but very difficult to lose those calories through exercise. You have to set your goals for what you eat throughout the day and how much you are physically active. Some basic rules for a good diet is drinking a glass of water after waking up, eating a lot of proteins in breakfast, filling your plate with a lot of colourfull vegetables. You need to change your lifestyle by eating nourished food, get moving, build up strength, sleep and de-stress well. Understand the calorie in your food that you are consuming and how much physically active you are to burn it. Yes, you need to eat less but you dont have to cut your calorie intake so much that you are not feeding your body properly. Eating less may be a great start to losing weight, but it isn’t a comprehensive approach and it has it’s drawbacks. When you simply eat less food, your likely to find yourself hungry after meals instead of feeling satiated. This is because your body is used to consuming a larger portion of food. You metabolism decreases hence you have low energy and mood swings so just eating less won’t help you have to adjust everything else accordingly. You can speed up your metabolism by exercising, so always keep a balance between the both. The key is not to kick your body into starvation mode by making a drastic cut to calories. A combination of diet and exercise is best for any stage of weight loss. Just make sure you are getting your 5-6 meals a day, increase you meal frequency and decrease the portion size of your meal. You need to replace higher calorie options with lower ones so you get more food with fewer calories. Whole grains, 100 percent whole wheat products, bran products, fruit, vegetables and beans have more nutrients and fewer calories than refined foods, fried foods, baked goods and processed snack foods (chips, crackers, pretzels, etc.). Achieving healthy, sustainable weight loss is about more than just “eating less.” It’s about sticking to a balanced, sound nutrition program and exercising more. Catriona Gray, from the Philippines is Miss Universe 2018.